When she first arrived in the "new world" ten years past, Diana's first glimpse of Lady Liberty standing tall in New York Harbor was a hopeful inspiration. Today, Director Bones doesn't like having to torture her, somewhere there in DEO Headquarters, but the deal he and Felix Faust made with Hades back in the day is not so easily broken. Plus he's got a national security interest in understanding what makes Diana "tick" - a preemptive strike against Themyscira appears not to be out of the question. Meanwhile, Clark is on-site and speaking just loudly enough for Diana to super-hear him - he's in search of Diana's mother, a task really not at all complicated by Special Agent Cameron Chase, who replaces Steve Trevor as Clark's guide on this tour, first aborted when the harpies attacked Lois and Diana in Washington (see "Olympus" chapter 3); this leg of the tour features a monkish pair of "celestial specialists" who take shifts casting a continuous spell to protect the facility from "magick." Clark soon excuses himself to the toilet and then infiltrates the "Black Room" he had super-spied, where he finds Diana's mother alive but in suspended animation. Story - 3: Here's where I'm at with this arc: the sum is worth less than its parts. Last time, I was saying I didn't know what I was supposed to care about. This week, I'm just saying it: I don't care about any of it. Again, it's not that I think it's technically "bad" work on Miller's part (except for the Martha-as-badass-hacker scene; that was bleak). Actually, let me retract that: I care about Bones. A little bit. 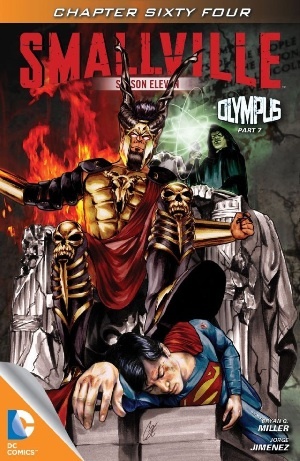 He's complex, and I'm happy to admit this is my introduction to him, so to my eyes there's a freshness about him that I just don't see in anything else "Olympus" has had to offer. Looking back at my reviews of the earlier chapters in this arc, I find I was pretty forgiving, happy about things that have since lost their gleam. In my chapter 3 review, I actually wrote: "There is a vibrancy to this arc so far that is unusual for Smallville, in a very good way. A lot of it is the art, which has a life of its own, but it's the little things with this, too." Oh, the excitement of early goings! (In retrospect, almost all of that "vibrancy" was the art.) It's also very possible I was drinking a rum and coke while writing that. Seems I've also been expecting Diana to be romantically and/or physically attracted to Clark, but do we agree that that hasn't even been a factor? And while that's also cool in the please-excuse-Clark-from-any-further-confusion-and/or-frustration-where-these-kinds-of-interpersonal-dynamics-are-concerned kind of way that I fully endorse, still it would (and still could!) have been a good way to reinforce both the emotional stability he's supposed to have now that he's Superman (as opposed to "The Blur") and the strength of his relationship with Lois specifically, since that's supposed to be "central" or something to the whole, if I'm remembering my interview with Miller correctly (how he actually describes the relationship, if you really don't care to follow that link at this time, is "vital," the "heart and soul of the book"). Then again, an effort specifically to avoid sexualizing Diana would also be commendable (though too late, visually if not altogether narratively, even if it has been in reasonably good taste, by and large). But if it's just to avoid mixing in the New 52's continuity waters or something legalese and extra-narrative like that, then it's not a good move. Anyway, it's good to know that the "Crisis" story will resume by the time "Season 11" ends and the new mini-series format begins. Don't know about you, but I'd forgotten all about it. Art - 5: "Yeah, I just... I mean... yeah." Cover Art - 4: And there's Hades. Welcome, sir. Is that the appropriate amount of groveling? That didn't sound like groveling at all? Well, see, you seem unnecessary to me in a world that features godlike beings who walk, fly and super-speed over the earth and who, despite not actually being gods, will, I just know, somehow eventually best you. But there you have it. Be summoned and unleashed, for the next few weeks at least. I'll work on my expression of fear and awe. But pretty god - sorry, I mean good - pencils, inks and colors; too bad about the underwhelming composition. Like Superman is really going to die!